* That last one was too long for a bullet point. I couldn’t even do a PowerPoint slide about why this stuff shouldn’t be in PowerPoint. That’s how feeble a tool PowerPoint is for serious discourse. It’s frustrating, so as a displacement activity I went looking for a copy of Edward Tufte’s excellent “The Cognitive Style of PowerPoint” – an expertly conceived and adeptly executed attack on the glib and reductionist presentation style encouraged by Microsoft’s horribly ubiquitous slideshow application. I couldn’t find an eBook for you to download, but I did find that some smartass has condensed the entire 28-page essay into a 16-slide presentation. That seemed like precisely the kind of sarcastic tomfoolery I would get up to, so I had to share it. Thing is, that type of presentation didn’t start with PowerPoint. People were using bullet point presentations long before, using overhead projectors and transparent plastic slide. I don’t buy Tufte’s thinking that it’s just because of Microsoft; surely he should have seen many such presentations before people were using PowerPoint. I don’t think Tufte claims that any of the problems he talks about are exclusive to Powerpoint. It does, though, represent one place where all the problems (bullet points, a rigid linear flow, bad use of space, low resolution, silly charts, exclusion of important data, inflexibility and horrible design) all come together with spectacular consequences. …and I want to be very clear that when I say “I don’t think Tufte claims…” I mean “I have read this and I don’t remember him saying…”, not “I haven’t read this, but I don’t expect he will have said…”. If you need some comic relief while putting your presentation together, check out these “What Not to Present” contest winners. Ok. So the most completely awesome thing about this is that the “IT Modernization Roadmap” is exactly the thing I’ve been trying trying to put into a PowerPoint, and that nightmare is exactly what it would’ve looked like if I hadn’t decided this is stupid and I’m not going to do it. I have. 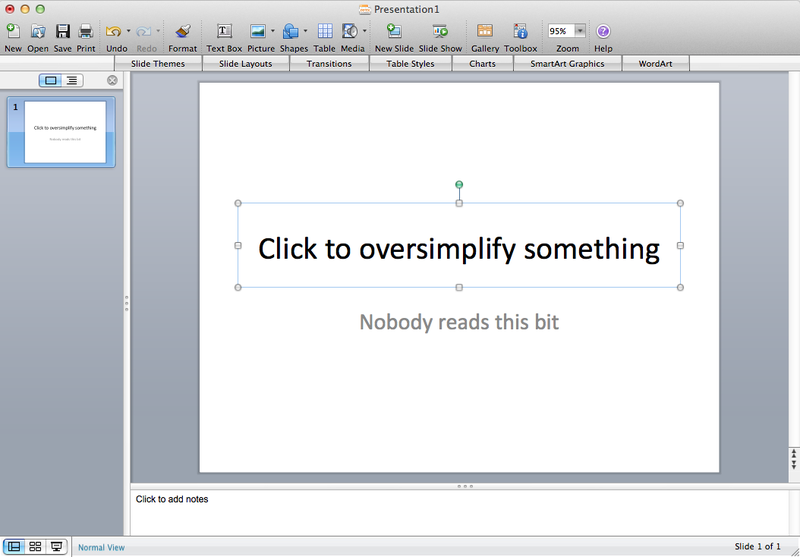 Whilst easier to use, I don’t really see how it overcomes any of my objections to PowerPoint. Surely, the all time all time God of visually supplementing a verbal presentation was Steve Jobs. And now that he’s gone, even Apple’s presentations are beginning to look like the same old, same old overhead projector presentation so in vogue in my youth.